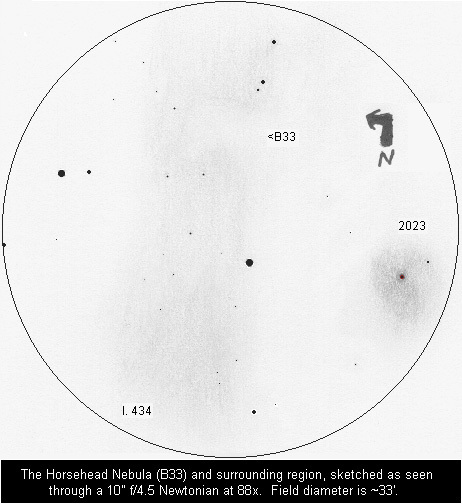 The Horsehead Nebula (Barnard 33) has attained a somewhat mythical status as a hard-to-see object. Usually, three ingredients are deemed to be necessary: 1) Large aperture; 2) a Hydrogen-Beta filter; and 3) Dark, transparent skies. If any one of these three is missing, then seeing the Horsehead is a pipe dream. On the other hand, I have also heard success stories from people with as little as 4" of aperture, and some of them even claim not to have used a filter! What's the truth? First, let's clarify just what the Horsehead is. It is a rather small dark nebula near Zeta Orionis or Alnitak, the easternmost of Orion's three bright belt stars. Some novice observers confuse the Horsehead with the Fish's Mouth, an intrusion of dark nebulosity into the Great Orion Nebula (M42). Suffice it to say that the Horsehead is much, much tougher than the Fish's Mouth, but the two objects are similar in a fashion. Both are dark nebulae (actually opaque dust) silhouetted against bright emission nebulae. The bright nebula that makes the Horsehead visible is IC 434, a very dim and diffuse object. The faintness of this background, and the smallness of the Horsehead (size 6' x 4' according to The Night Sky Observer's Guide [NSOG]*) make it imperative to know exactly where you're looking. 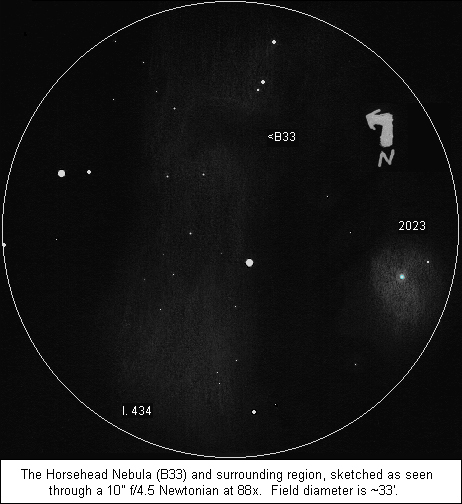 My first look at the Horsehead came in 1993 at a star party on the flank of Oregon's Mount Hood. A gentleman had an 18" Newtonian with an H-Beta filter. I can't say that the Horsehead was very bright or impressive, but I walked up to the eyepiece and it was definitely there. I saw it on a couple of other occasions at star parties, always through a 16" or larger telescope and an H-Beta filter. Anything less seemed to fail. One of these failures came at the 1999 Oregon Star Party. Saturday night at that event remains the most impressive night I have witnessed, with a limiting magnitude of 7.6. Sky contrast was outstanding. At some point on Sunday morning, with Orion rising higher in the September predawn sky, I thought: "I wonder if the Horsehead is visible?" My only scope at the time was a 60mm refractor, the Scope of Death. I pointed it at Zeta Orionis and saw NGC 2024, the Flame Nebula. I slewed to the south to look for the Horsehead, but nothing jumped out at me. I tried the same thing with a borrowed 8" Dob. I think I realized at the time that I needed a better map than Sky Atlas 2000.0. "With 27x, I thought I could make out a portion of IC 434, so naturally I went Horsehead hunting. 79x proved to be a great help in locating faint guide stars and even in firming up the view of IC 434. The image was fleeting, but at best resembled a ribbon of cirrus. I was not able to see the Horsehead, but I had the feeling that just a little more contrast..."
The sketch to the left shows approximately what I saw. I've flipped the view to show south down and west (preceding) at left as in a standard inverting telescope. The sketch covers an area about 1.4 x 0.8 degrees. I tried to choose brightness and contrast settings that will work with most systems; if you don't see IC 434, turn the monitor brightness up or turn off any room lights. If the sky background is too bright, turn the brightness down. In any case, this shows the major features of the region as they appear in a small telescope. But, this ranks as yet another Horsehead failure, no matter how encouraging. "NGC 2024 showed tremendous detail, and NGC 2023 was impressively large. It's not that much of a jump to the Horsehead, and I suspected it at 44x. At 88x, the dark nebula was definitely seen with averted vision, and its shape popped out as well." March 4/5: "Horsehead region: Sketched at 88x. Not my best view of B33, but it wasn't too difficult. It appeared as a broadly rectangular void, with occasional views of a bright intrusion into the SE edge that gives the head its orientation. IC 434 is not well-defined at all, and is more conspicuous by its absence to the east of the Horsehead. The brightest portion of IC 434 is a wedge north of the 8th-magnitude star in the center of the sketch. NGC 2023 is an impressive object, a bright bluish glow around a 9th-magnitude star. Within the glow is structure resembling spiral arcs, and there are dark lanes on the E and S sides." The sketch is reproduced below and only contains the immediate vicinity of the Horsehead. 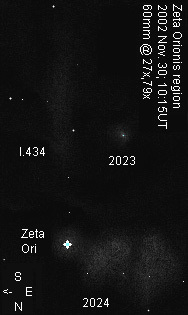 With a low-power eyepiece, hop from Zeta Orionis down to NGC 2023, which will be easily visible. Then, follow the visible stars to the Horsehead. The naked-eye limit in the area was 6.7-6.8 during most of my successful attempts. If you have an H-Beta filter, by all means use it. It's not cheating. But, please also try it without the filter. I have heard reports of other nebula filters improving the view as well (and an equal number of reports saying they don't work on the Horsehead). Experimentation is probably the order of the day. A negative version of the sketch is available, if you prefer that format. Good luck and happy hunting! * Kepple, G. R. and G. W. Sanner. The Night Sky Observer's Guide. 1998: Willmann-Bell, Richmond, VA.